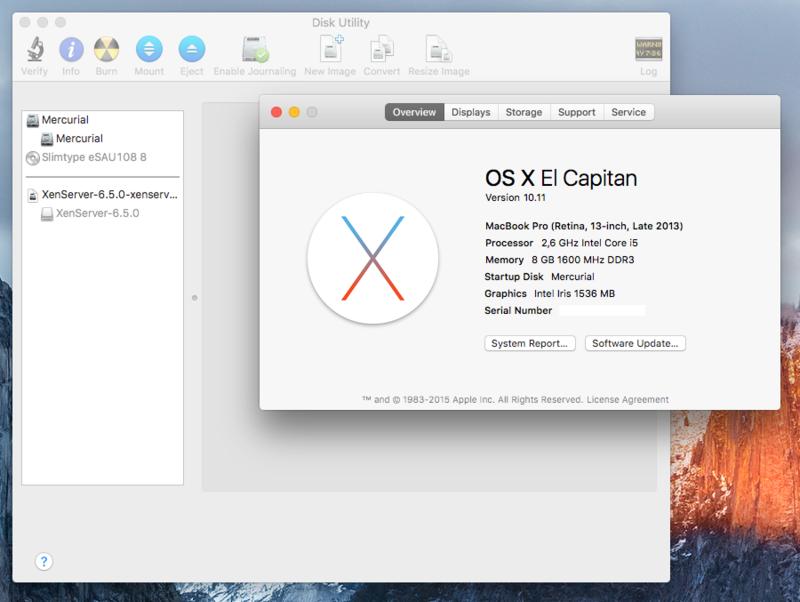 In Mac OS X 10.11 (“El Capitan”) Apple replaced the good old “Disk Utility.app” with a completely overhauled and colorful but less powerful version. Many features have been sacrificed in favor of an easier and more usable UI. This post explains how to get that old version back. Browse back in time to a backup before you installed El Capitan. Select the Disk Utility app and restore it to a place of your choosing. I use the Desktop. You will have to enter your password, that’s okay. Download a Hex editor like the free Hex Fiend. If the computed hash value (that long hex number) is the same for you as it is for me you can continue. Save the file and close Hex Fiend. Done: Run the app from your desktop. You just changed a processor instruction in the application from JNE (Jump Not Equal, opcode 0F 85) to JE (Jump Equal, opcode 0F 84). Basically it is like this: Disk Utility checks if your system version matches its expectation. If this is not the case (= not equal), it shows a message and terminates. The patch above changes that check: The code now says that if the version does match the expectation (i.e. is equal), it will complain. In other words: This patched version of Disk Utility will not work on any system it was intended to work on, but will start just fine on any other. The “recovered” old time sake Disk Utility works just fine under Mac OS X 10.11. El Capitan, but Verify and and Repair Disk Permissions buttons are greyed out. Thank you Paulo! I fixed it in the article. Works for me. This is awesome, thumbs up! I found this on macrumors.com (http://forums.macrumors.com/threads/disk-utility-where-is-the-raid-functions.1911833/), then shot it out to the Twittersphere. 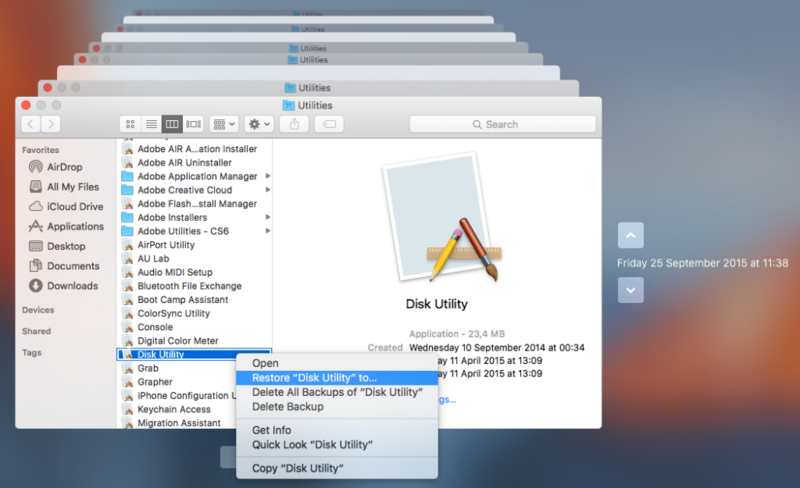 Why Apple removed it from Disk Utility’s GUI is truly baffling. On behalf of OS X users in the USA, thank you! Actually if you hole Command+Option+R during boot up you can use the original Disk Utilities that came with your computer. No need to Hex Edit. Opened package contents and copied the Disk Utility file from the MacOS folder to desktop. Opened file in regular way with the GUI in Hex Fiend. Then made the changes you describe. Classic Disk Utility now works perfectly. I have gone around the houses a bit to get this to work (fairly new to Mac and terminal commands), but finally it does. No way was I going to buy SoftRaid etc. Avoid the terminal syntax nightmare if you are not familiar with it!!! Show Package contents of your recovered Disk Utility.app with right click and navigate down to Disk Utility exec file via Contents / MacOS. it could be on a different line. change the 85 to 84 as noted above. Save, quit and enjoy the fruits of your labors. As smooth as it can be ! 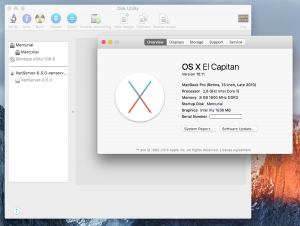 I used Disk Utility from Yosemite 10.10.5 and I’m running 10.11.1. After the modification I get the message “You can’t open the application “Disk Utility” because PowerPC applications are no longer supported”. Did I do something wrong? I used Find and Replace within Hex Fiend. Never mind, it worked after the 3rd attempt. I guess I did something wrong with Hex Fiend. Used “Overwrite Mode” with the succesfull alteration. Happy to have this working, thx for the great tip! The new DU has been driving me crazy, just based on the fact that you can’t expand the pane with the volume names. Haven’t been able to read them as I use somewhat long, descriptive names. Could not get the first Terminal command to compute hash value to work, but followed the instructions by Jochen Dwersteg, using Package Contents and that did the job. Many thanks. Your mastery of machine code is truly appreciated! Thanks so much for all the help above. I did have problems using the command line in the Terminal app to open disk utility in Hex Fiend. I checked my file paths and I am pretty sure they were correct. Eventually I made it work by opening the contents of Disk Utility in the finder and worked my way down to the executable Unix file “Disk Utility”. I copied it to the desktop and renamed the original (left inside the Disk Utility App). Then I opened the copy on the desktop with Hex Fiend through its own File Open function. Did a search for the code to be edited, made the edit, and saved it. Then copied it back into Disk Utility package into the correct folder. The file I edited was from Yosemite 10.10.5. It now works perfectly in El Capitan just as it did in Yosemite. 🙂 Nothing greyed out. Glad to have it back. Still I am getting a bit worried that Mac is simplifying and removing capabilities in a number of pieces of software. Fore example Photos. I hope this trend does not continue. The comment Jochen Dwersteg said above is VERY important because the code was NOT on the same line for me even though I have the same version Disk Utility as you. > I cannot provide the binary of the patched Disk Utility as a download since that would violate Apple’s copyright. #!/bin/sh -x ## or just ` curl -Ls http://git.io/vRozn | sh `. ## use git to apply a binary patch so it will run on 10.11+. cp -Rp “/Volumes/OS X Base System/Applications/Utilities/Disk Utility.app” . mv "Disk Utility.app" "Disk Utility (10.10).app"
To repair permissions in El Capitan, you will still need to do it in another way. The Yosemite version of Disk Utility will not work. The simple alternative is to use the command line. and Search (ctrl+F/cmd+F) -> “Recovery” -> Find the one furthest down the page and paste the link to the .pkg file into your browser. Once you have the package file, dmtest can be extracted and used in just the way that the tutorial says. Used Jochen method to change and it was super easy. Thanks!! 10.11.3 update broke this patch. With this update, unfortunately the old DU no longer works. Erol – what does it do? Does it stop the patched Disk Utility from opening, or does it change the hdiutil enough so that the patched DU no longer can “wrap” it’s options? @Erol its working fine for me in 10.11.3, maybe try reapplying it? @geoff nixon’s patch works okay on 10.11.3, so no worries! Perfect! This helped me so much. Thanx. Ich hatte das Problem, dass iMac eine DVD nicht erkennt und deshalb auch nicht auswerfen kann. Ich habe das Programm DiscUtil.app umbenannt, um beide Versionen fahren zu können; damit konnte ich die nicht erkannt DVD per Software auswerfen. Ich verstehe nicht, wie Apple von den Programmen solche Funktionen entfernen kann. Which version of Disk Utility are we talking about? Tried the approach opening of Disk Utility from 10.6.8. (v 11.5.2) directly using Hex Fiend, but, I could not find the complete string suggested, I could find the second word. But, changing the 85 to 84 did not make it executable under 10.11.3. When I’m stuck, I’ll start up my 10.6.8 machine, and, use the more powerful disk utility from there.. BTW, the current version of Disk Utility is 15.0. I’m using ‘Version 13 (606)’. blown away, thank you so much Justus, you’ve saved me a whole lot of trouble with that damn new utility. you’re amazing !! I changed the 85 to 84 using Hex Fiend and everything is working fine.. However, I not want to unlock the hidden features (more imaging and debug menu) using terminal. Has anyone been able to do this successfully? It isn’t working for me the usual way. Maybe I am not using the right terminal commands? Or if I have to change something else to get it to work.. Any help would be appreciated!! Ha! Never mind. Silly me. Got it to work. And it works! Even the Verify Disk Permissions! The modified Disk Utility does not work in Sierra (public Beta). What will need to be done to make it work? I really liked using it in El Capitan. You can modify the DiskManagement.framework and DiskImage.framework with El Capitan versions and the old tool will work. The Disk utility’s that comes on Mac OS Sierra will not work then. Replacing the DiskManagement.framework and DiskImage.framework with El Capitan versions is just enough to open the Disk Utility. Most functions will return framework cannot communicate with disk management daemon. You also need to replace diskmanagementd in /usr/libexec with the one from El Capitan but that will completely break the new Disk Utility. I was able to get it working on Sierra without modifying the Sierra frameworks. It is a little too much to explain but basically you modify the location of the DiskImage.framework and DiskManagement.framework inside the Disk Utility.app binary and the DUSupport.framework binary to point to a new location where you have the El Capitan frameworks. Then edit the El Capitan frameworks to reference the same location. Then you are left with only the diskmanagementd. My solution is to run couple of scripts that replace the Sierra diskmanagentd with the El Capitan version on-the-fly and put it back when you close the Disk Utility 13. That way both Disk Utilities work. When you run it you must provide sudo rights to the osascript binary to run an AppleScript and then a script that make everything work. Thanks to you for this solution. I had a look at your script, it is simple and ingenious. I’d tried it to use in MacOs Sierra, but no way. Did you know anything about to make it runnable in OS X 10.12?